Ali talks to Dartmouth students about the meaning of "conformity" on campus. Dartmouth’s men’s basketball team has not appeared in the NCAA Tournament since 1959, and it seems unlikely that it will do so in the near future. A voice cries out in the ... kitchen? 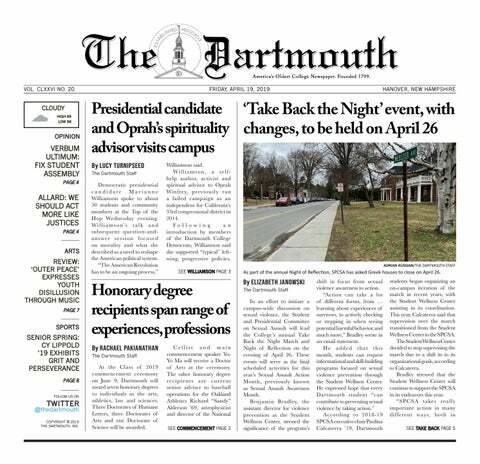 While the College’s motto may not seem to apply to employees of Dartmouth Dining Services, their voices are certainly worthy of attention. “Did you know the ‘Lou’s challenge’ isn’t free?” my friend asked as we passed by Lou’s restaurant. “Of course,” I replied, baffled. Just for a second, take yourself back to the elementary school playground. Do you remember how easy it was to be a psychic when you were a child? While you may have seen Dartmouth’s two improv groups, Dog Day Players or Casual Thursday, perform at a fraternity or campus event, you have not seen them like this before. Distance runners discuss endurance running as a form of escape.